SEAQUESTER - OceanFront Favorite with Private Pool, Hot Tub! UPPER LEVEL has been renovated with Kitchen featuring new cabinets, counters 2 stainless steel 3-Door Refrigerators and more; Dining with a table for 10; and two Living Areas, one with a great stone fireplace; a Powder Room, as well as a King Master with upper level deck access-Master Bath has 3'-wide doors for wheelchair accessibility. GREAT ESCAPES STANDARD FEATURES: Central Heat/AC; Color TV with Cable or Satellite; DVD Player; Radio, Stereo or Docking Station; Cleaning Tools; Baby Gate; High Chair; Portable Crib or Pac-n-Play; Pillows; Blankets; Washer/Dryer; Iron & Board; 5 Beach Chairs; Deck Furniture; BBQ Grill; Outside Shower. Kitchen Furnished with Dishwasher; Microwave; Blender; Coffee Maker; Mixer; Icemaker or Trays; Pots, Pans and Ovenware; Dishes; Eating, Preparing and Serving Utensils. SEAQUESTER EXTRA AMENITIES: Private Pool (**Heating w/Fee Available); Hot Tub; Elevator; Sand VolleyBall Court; Private Walkway to Beach; Basketball Goal; Gas and Charcoal Grills; Electric Fireplace Available October-March). NO SMOKING. 5 BEDROOMS accommodate 14 in 4 Kings and 2 sets bunk beds. Sheets are Provided, with the beds made for your first night (top bunks will not be made but sheets will be left for you). Bath Towels are Provided for 14. The house has been nicely updated. The layout is great for groups, and the kitchen is really well stocked. Great location at the end of a quiet street with direct access to the beach. Liz, So glad you enjoyed spending the Holiday Week at SEAQUESTER. It was a lovely week.Hope we will see you again soon! This was a family reunion for us. We were excited about all Seaquester had to offer and really enjoyed ourselves. The elevator was a life-saver for a couple of us with medical issues. Our only disappointment is that the walkway to the beach was completely covered over with sand and was not usable. The online photos and descriptions did not reflect that it was not usable. We were looking forward to the dune-top benches for one elderly member of our party, but it was completely covered and 'under' the dunes. However, the rest of the propery and all the house offers are great! Mark, So glad SEAQUESTER fit your family reunion fun. Sorry for the walkway disappointment. Law states that we are unable to move sand from man made structures being reclaimed by the dune line. I have passed on your suggestion up to management and owners to see about modifying the description and pics until a new set of steps is approved by the powers that be. Thanks for taking the time to let us know about your stay here. The house is great and so nicely redone. We had an amazing week in OBX while staying at Seaquester. The house is great and decorated so nicely. The upgrades were all nicely done as well. The two refrigerators were amazing to have. The house was very clean and had all the amenities we could ever need. The accommodations on the top deck were also great for early morning coffee or a late night glass of wine while listening to the waves or watching the moon rise over the ocean. We thought we’d be closer to town and the kids would be able to ride their bikes there but unfortunately the little ones couldn’t make it. Not much of a big deal because it was so hot we spent most of the day in the pool. The heat also caused the sand to be unbearable in the afternoons. We know there used to be stairs and a landing but the dunes now cover them up. Some type of mat like they have for public access would be nice. There were a few maintenance issues during our stay but they were all handled in a timely matter. The one issue we did have is when we arrived on Saturday the first thing you saw were 5 garbage containers overflowing. The renters before and possibly the ones before them had not taken out the garbage to the street as requested. We felt it a bit unfair that we were repsonsible for hauling out all the containers. When I called to question the fact that the responsibility now fell on us, I was told the rental company has nothing to do with that and it’s unfortunate the prior renters didn’t do it. Maybe hire a service or somehow implement something to ensure everyone takes out their own trash. All in all it was a fabulous week in a wonderful home! The property is beautiful and all amenities were perfect. We loved the house and our stay was great! We had every intention of booking the house again next year for the same week, until the rent increased by such a large amount. Thanks Linda for taking the time to write a review! We loved working with yout while you were here and hope to see you soon. The owners have renovated the past couple of years and have adjusted the rent to reflect the new elevator, kitchen/great room areas and other additions. We had stayed at this place 3 other times 2012, 2014 and 2015. It was getting old and needed some updates. The updates they did were unbelievable. We almost didn't recognize the place. Adding an elevator and increasing the size of the dining room and moving the stairs, so many enhancements. One of the biggest we feel is making a screen in porch in front to art of the house. We would sit there all the time and look at the ocean. The housekeeping was great all the beds were made for us and it is amazing how clean the windows were because by the end of the week they were dirty so they clean very well for every rental. If we were going to the outer banks next year we would stay there without a doubt. Thanks, Upstate NY for this great review. We agree that SEAQUESTER is practically unrecognizable so many upgrades all well thought out for the guest....(The Screened Porch is one of my favorite features.) Can't wait to see you next year. We stayed for seven days and the house is very beautiful and well decorated. It was very easy to get to downtown Duck and a short drive to Corolla as well. Loved the restaurants in the area and the jogging/bike paths. 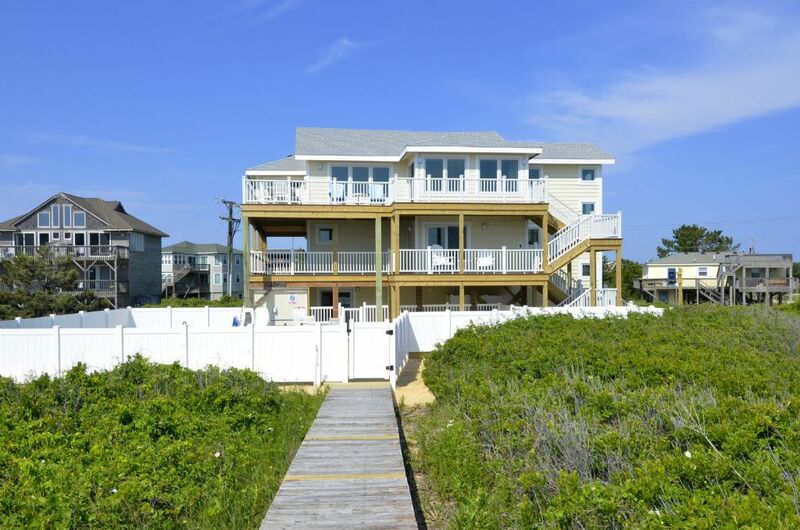 The house is directly on the ocean and does have a private boardwalk to the ocean but the sand dune is covering the boardwalk so you still have to climb the dune (through sand) to get to the ocean (they are not allowed to dig the boardwalk out because the dune protects the house). I didn't think the climb was too horrible, though. In addition, the pool looked pretty dirty when we arrived and I called the leasing office to ask for it to get cleaned and they said that it had already been cleaned. I later saw in the home's journal that the walls of the pool always look dirty because of a defect in that material and that there is a class action lawsuit against the manufacturer of that pool regarding this (not sure why the leasing office didn't mention that when I called). Either way, it is still perfectly safe to swim in the pool, so it didn't stop us. Lastly, this complaint is more against the leasing company - they had published on their website that there was a trundle bed in the kids room (so the kids room was supposed to sleep 5). That was one of the big reasons we picked this house, because we could have all 5 kids sleep in one room together. When I arrived, though, there was no trundle and I called the leasing office and the woman I talked to said that it was an error on their website (they corrected it after that) and there is actually no trundle bed there. They said they would have a roll away bed delivered and then later called back to say the roll away bed would not be delivered until the next day. So, we had to have one of the children spend the first night in his parents bedroom. Then when the roll away bed showed up the next day, it was disgusting! It wouldn't even lay flat! We just took the mattress off of it, wiped it down with a wet rag, put sheets on it and placed it on the floor in the kids room for the week. I felt the leasing office didn't really go above and beyond on this one - especially since it was their error that caused it. They could have at least brought us an inflatable mattress that first night instead of absolutely nothing (they did say that the couch upstairs folded out into a bed, but we couldn't have one of the kids up their alone when all of their parents were on the second floor).